I’ve always dreaded getting a cold as I get so stuffed up at night, it’s hard to breathe. About 2 years ago, I discovered Breathe Right Strips. They’ve been such a life saver getting me through nights of congestion. They’re a drug free way to open up the nasal passages to allow better breathing. I notice immediate relief once I put on the nasal strip. I’ve even used this around the house during the day when congestion is really bad. 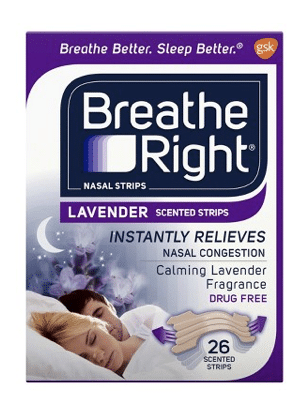 There’s a very high value coupon you can print right now for Breathe Right Strips. Even if you’re not sick currently, these are good to have handy when a cold does hit your house. You can print two copies of this coupon per device, including mobile. 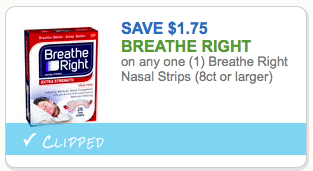 Target has the best price I’ve seen on Breathe Right Nasal Strips, so head there for this great deal. As low as $7.04 after coupon! If you head to the drug store, these go for as much as $13.99 a pack, so this is a nice deal!